Although it’s quite possible to keep a vegetable garden going late into the fall and even through the winter with protection, we give ourselves a break in the demo garden and let things wind down beginning in October, with final clean-up in November. Through the season we enjoy lots of the products of our garden, and while we invariably have disappointments, we also have favorites, veggies that go on the YES WE MUST GROW THAT AGAIN list. Here are two of mine, which I highlight because in one way they’re total opposites, but have a certain determination and vigor in common. 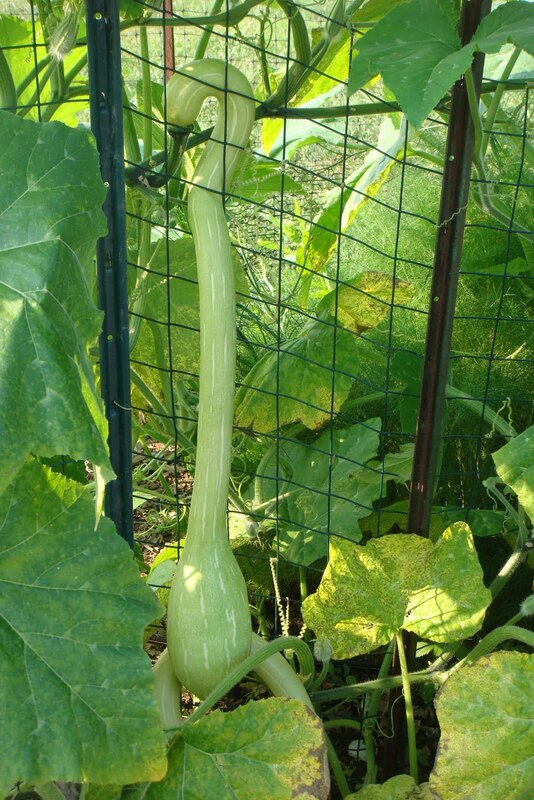 And I wouldn’t say the zucchetta grows slowly, either. In fact, turn around and it’s grown bigger on you. 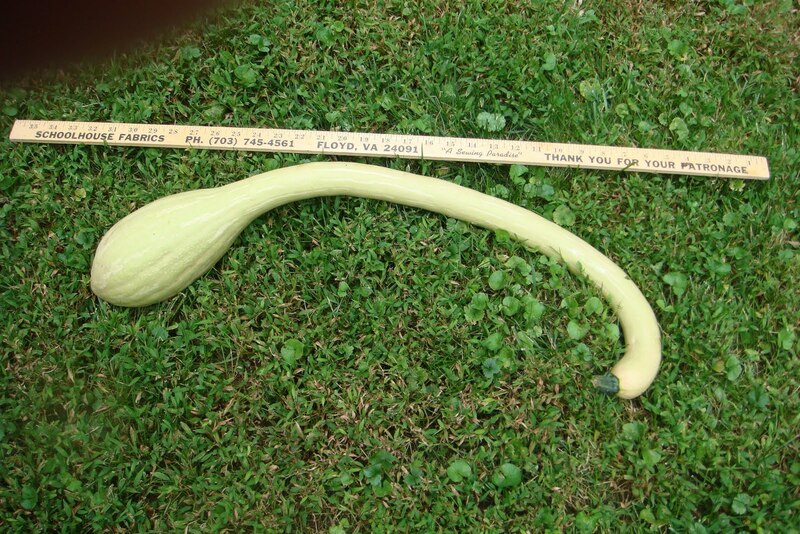 It is a tasty squash, though, and fun to grow if you have the space. It grows well up a trellis if you speak to it persuasively, and keep coaxing it in the right direction, though really it would prefer to spread out horizontally across your entire garden and smother your eggplants and bush beans and then grow up the trellis you really meant for fall peas. The fruits will curl a little as they hang and a lot if they lie on the ground. Next year we’ll grow it on the tall fence where the scarlet runner beans are this year. I don’t know where the scarlet runner beans will go, but I do know the zucchetta has to be kept well away from the exterior deer fence, because it’s attempted to grow through it several times this year – not just vines but fruits – and the extractions have been… interesting. On the opposite end of the size scale is the tiny-fruited plant we’ve been calling Mexican sour gherkin because that’s how the seed was sold to me. However, I learned a new name for it the other day, again from William Woys Weaver (a wonderful lecture he gave on heirloom vegetables at the Monticello Heritage Harvest Festival). The plant, which is related to cucumbers and similar in taste, is actually native to Mexico and Central America, and one of the names for it in Spanish is sandia di raton, or mouse melon. It does look very much like a miniature watermelon, the sort you might serve to mice. So that is what I’m calling it from now on. It’s a crispy, juicy snack direct off the vine, good in salads, good for pickling (I haven’t tried that yet because I never end up with enough left over, but this is what I hear). The vines, with leaves just like those on a cucumber plant but tiny and less rough, are vigorous but not far-rambling, and don’t seem to be affected by the wilt that devastated all the true cucumbers in the garden. I’ve never seen an insect on them except for bees on the flowers. They’re attractive plants and next year we are growing them close to the path where we can show them off. 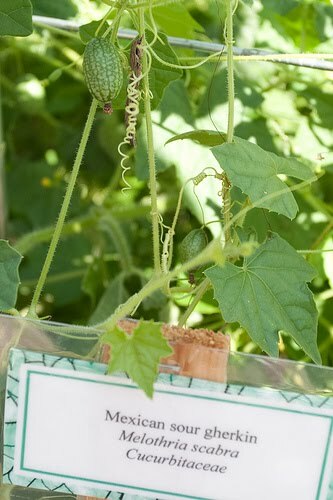 Read William Woys Weaver on mouse melons here. Come early to the Harvest Festival on Saturday, October 3, and I’ll try to have some mouse melons for you to snack on. Please do not bring your mice.